Provide comfort for the family of Bruce Emmerson with a meaningful gesture of sympathy. It is with profound sadness that we announce the passing of our beloved brother Bruce. Although Bruce had many challenges through out his adult life, he always had a joke or a tease for all that knew him. He always loved having family and extended family around him. 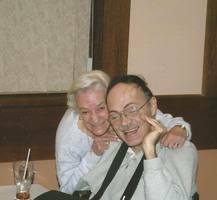 Bruce loved model railroading and had an extensive collection of engines and cars. Left behind to miss him are his sisters Cheryl (Rob Harding) and Heather (Barry Bouckley), nephews Chris Hadner (Jenn), Neil Hadner (Denise), Isaac Bouckley and niece Lea Bouckley as well as great nephews Liam and Lochlan Hadner and great nieces Hannah Hadner and Brynn Hadner. Will also be missed by many aunts, uncles and cousins and friends. Predeceased by Mom and Dad (Eldon and Muriel). Thanks to his extended family at St. Gabriel Villa, who always showed him great care and compassion. A very special thank you to Dawn. As per Bruce's wishes there will be no visitation or service. Cremation has already taken place. Donations to Camp Oochigeas for cancer kids or St. Gabriel Villa or charity of your choice. Arrangements entrusted to Sudbury Park Lawn Cremation Service. To send flowers in memory of Bruce Eldon Emmerson, please visit our Heartfelt Sympathies Store. Consider providing a gift of comfort for the family of Bruce Emmerson by sending flowers.